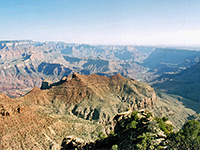 Navajo Point is just half a mile west of Desert View and offers an alternative view of the Colorado's 'big bend' area. Parking is right next to the rim, just off from the main East Rim Drive road and sheltered from it, so this would be a good place for an early morning breakfast, to watch the changing patterns and colors on the western cliffs as the sun rises. 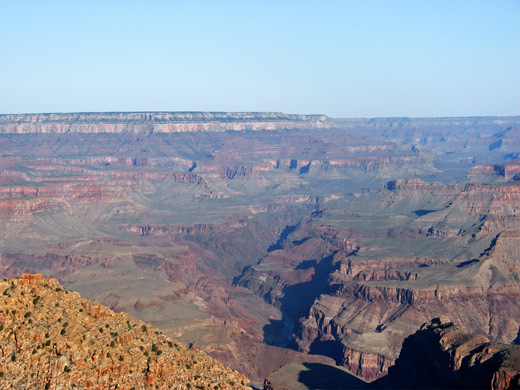 At 7,498 feet, Navajo is the highest spot anywhere on the south rim, though the top of the 5 storey watchtower at Desert View is slightly taller. Directly below the rim and 2,000 feet lower down are Escalante and Cardenas Buttes, next to Tanner Canyon. Several miles of the Tanner Trail are in view, running past the buttes then along the canyon all the way to its junction with the Colorado River at Tanner Canyon Rapids. North of the rapids, several miles of the river can be seen, almost as far as the confluence with the Little Colorado River, then beyond this, the most distant land in the north is the Echo Cliffs and Painted Desert. To the west a huge expanse of the canyon stretches as far as Yaki Point on the south rim and Shiva Temple on the north rim. 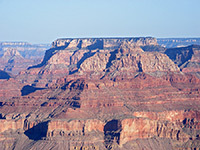 As with Desert View, since most of the view is to the west, the scene is best photographed in the morning.